Six weeks in a cast and on crutches was non-negotiable. As soon as I fell and realised the implications, Jesus seemed to say to me very clearly that I could instead choose to do this in an open way - open to the possibilities, to the changes, to what He would teach me. So with the Holy Spirit's help, that's what I've tried to do - to journey these six weeks honestly and openly. Through it all I know He's met me and taught me so much. Lots of people say "oh there's a preach in this for you" and I reckon yes, there are observations, experiences and plenty of funny stories I'm going to enjoy sharing. But more than anything, He's been doing an internal thing. Not only has He been healing all the internals of my ankle and knitting them back together again, but He's doing an internal work in my life in so many heart areas... Trust...Dependence...asking for Help...Waiting...Patience...Slowing down...Resting...Identity. So I'm thankful for the gift of this time. And I'm praying for lasting fruit. You used to live at the back of the drawer; I only wore you very occasionally. But for the last 6 weeks you've been the absolute star of the show! 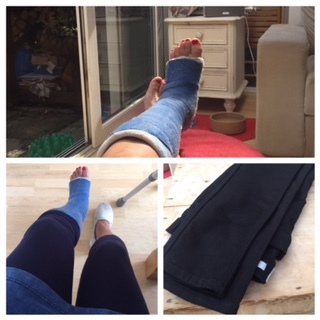 The only pair of leggings I could fit over my cast - pretty much worn 5 days out of every 7. I need to let you know that the end is near, and it's almost time for you to go back in the drawer. you see I've been into "New Bracknell" and I've replaced the jeans I had on when I slipped...my favourite skinny black jeans - the pair they cut off me later that day! Thank you for being there for me, old navy leggings. Welcome to the wardrobe, nice new black jeans.